It’s my mother’s birthday today*, so at the weekend the whole family got together at her new house in Somerset for a bit of a celebration. It was also my youngest nephew’s first birthday and had just been my other nephew’s second, so there were many reasons to celebrate. After much to-ing and fro-ing and several abortive attempts, we managed to get everyone together for a group photo. So here they are. This – for better or worse – is the family. 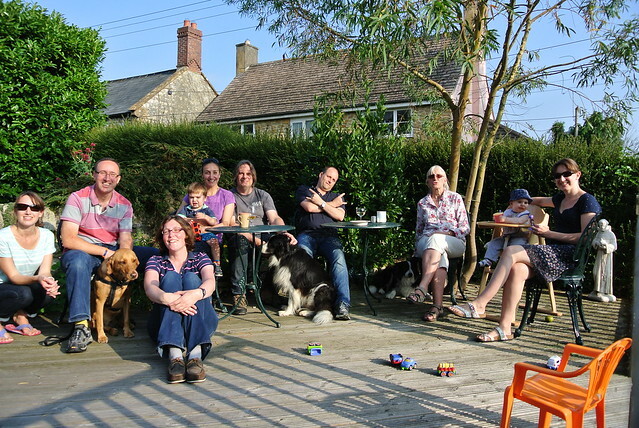 From left to right we have: Julia (sister), Me, Molly (Labrador), Natalie (wife), Edward (the nephew who’s two, Julia’s son), Sue (sister), Dave (Sue’s fiance), Vasco (Border Collie), Seth (Joe’s husband, and perhaps not the gangsta that he thinks he is), Hal (Border Collie), Mum, Otto (the nephew who’s one, Joe and Seth’s son), and Joe (sister). Oh, and the statue of St. Francis on the far right of the shot is an actual statue. It’s not some kind of spooky apparition. Just wanted to nip that one in the bud. This entry was posted in Family, Photography and tagged Family, Photography by Simon Perks. Bookmark the permalink.